Collaboration was the framework of Francis W. Parker’s award-winning Dot Day program. For their 2016 celebration, school librarians, educational technology specialists, and first-grade teachers combined technology and literature to support the messages in Peter H. Reynold’s book, The Dot. The Chicago-based school received the 2017 American Association of School Librarians’ (AASL) Collaborative School Library Award for their unique project, “Dot Day: How Do We Work Together as Collaborators to Make Our Mark?” This award recognizes the beneficial collaboration between school librarians and teachers to truly make the most out of the library resources in a school curriculum system. The award-winning team includes first-grade teachers Sarah Weitz, Bev Greenberg, and Tisha Johnson, librarian Mary Catherine Coleman, and educational technology specialist Sarah Beebe. To kick off their project, the teachers read the book, The Dot, and encouraged their students to reflect on ways they make their mark in their individual lives, their community, and in their first-grade class. Then, at the library, the students went on and really made their mark with the awesome ArtBot creation. FableVision Learning reached out to Mary Catherine Coleman to learn more about the project and plans for Dot Day 2017. How did you learn about International Dot Day? When was the first celebration? I heard about Dot Day a couple a years ago from School Library Journal, blogs, and library circles. At the library we have always celebrated Dot Day with reading the book and doing Dot-inspired art projects, but this is the first year we collaborated and planned an extensive project around the day. What themes from the book The Dot did you use in your school’s celebration and how did you implement them into your program? Students focused on the themes of art and creativity as well as growth mindset, risk taking and learning new skills. Students focused on the ideas of how we make and create art. We talked about different ways we “make our mark” and students shared different ways they create art. We also talked about being open to trying new things and continuing to to try a new skill even if we are not “good” at it to start. Students talked about how Vashti changed from the beginning of the story till the end. They brainstormed words to describe how Vashti was feeling at the beginning and words they would use to describe her feelings at the end of the story. Students focused on how important and rewarding it can be to try something new and to keep trying something even if you are not perfect at it to start. 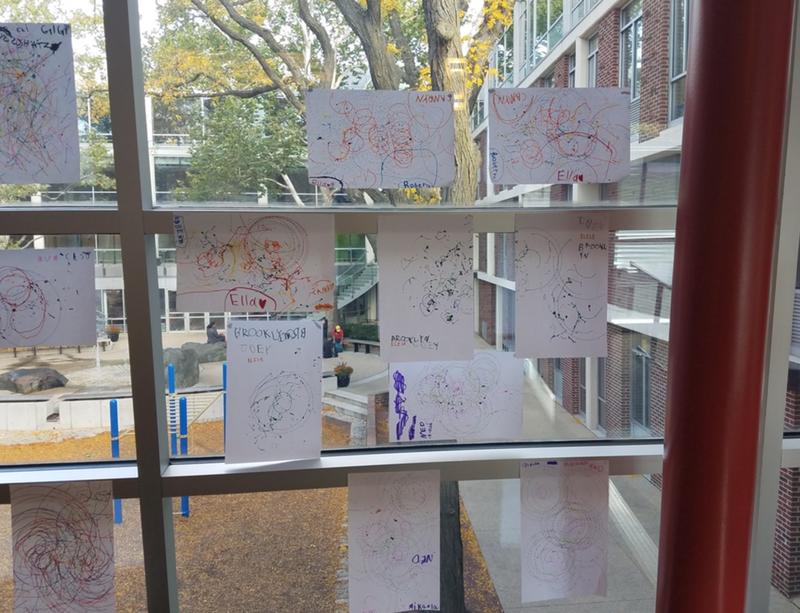 We then combined those themes in a culminating project where students were tasked with designing and building a robot that created a unique piece of artwork. 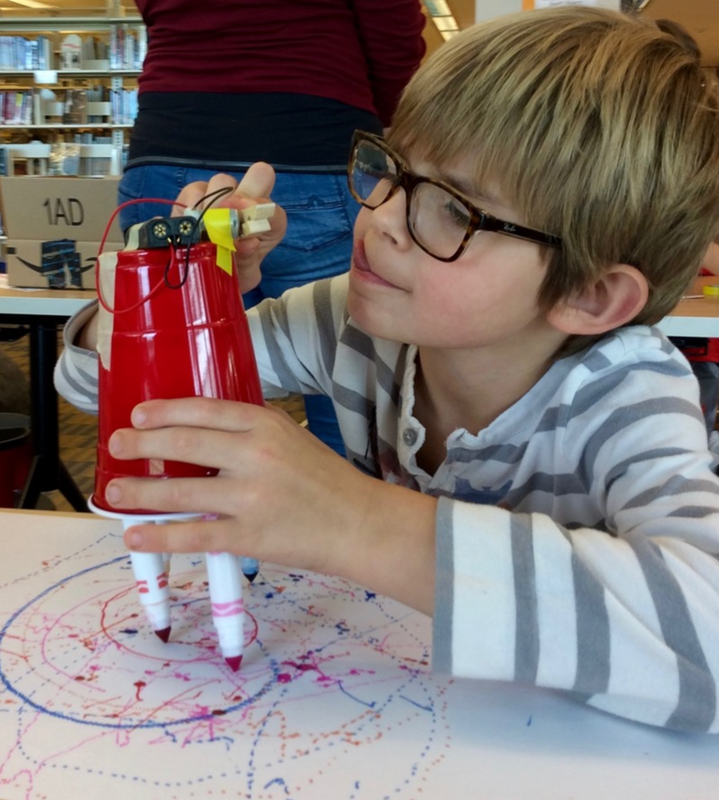 Can you tell us a bit about ArtBot 2016 and how it connected to Dot Day? 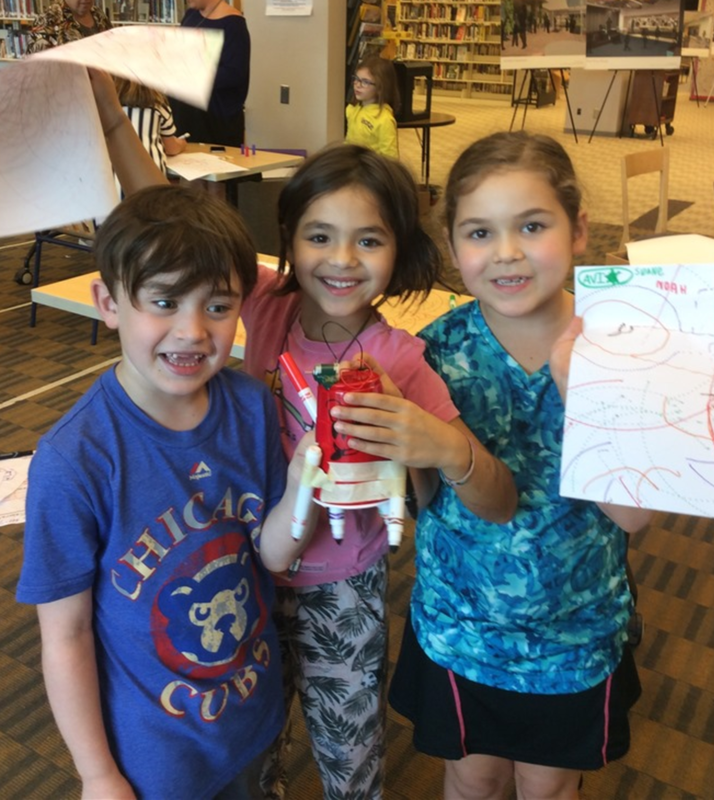 The ArtBot 2016 project was a way to connect Dot Day with literacy, the first grade curriculum of community, design and maker building together. Students focused on the idea from the book of making your mark with art and also how we make our mark on other people’s hearts by how we treat others. This idea connected with the first grade curriculum of community and how are we a good and helpful member of our classroom, school, and larger community. We focused on how we work with others when we collaborate. Students brainstormed and thought about a time they created something with someone else and what made that an enjoyable experience. They shared their ideas and we sorted them into themes. Students realized there were four important qualities that contribute to being a good collaborator: listen, compromise, work together, and everyone is included. Next, students were put into small groups and given the challenge to design and build a working robot that would create unique works of art. First students set the norms for their group, what would be the rules they would follow to make sure that they were being good collaborators based on the collaborator qualities. Some of the ideas included going around the group for everyone to share their design ideas first to ensure everyone was able to share, to prevent interrupting, students putting a thumb up when someone was speaking to illustrate they wanted to talk next, and making sure at least one idea from each team member was included in the robot design. Next, students designed their robots and starting building. During this process there were many connections with The Dot theme of continuing to try something even if you are not successful the first time. Many of the first designs students had for the robots did not work. They worked with their groups to talk about what went wrong and try new ideas to get the robot working. 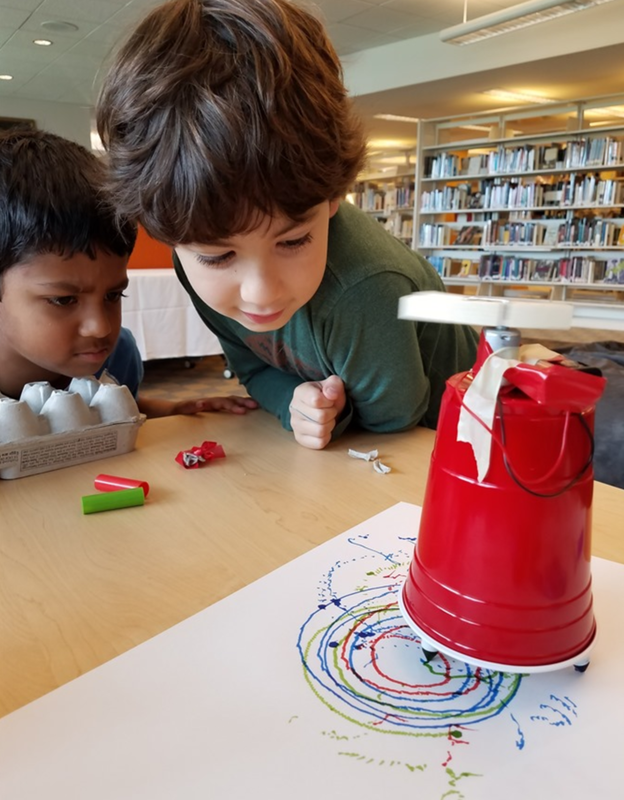 Finally, every groups produced a working ArtBot and created unique pieces of art that were displayed in our Dot Day art gallery in the school. This was inspired by the Dot art show that Vashti had at the end of the book. 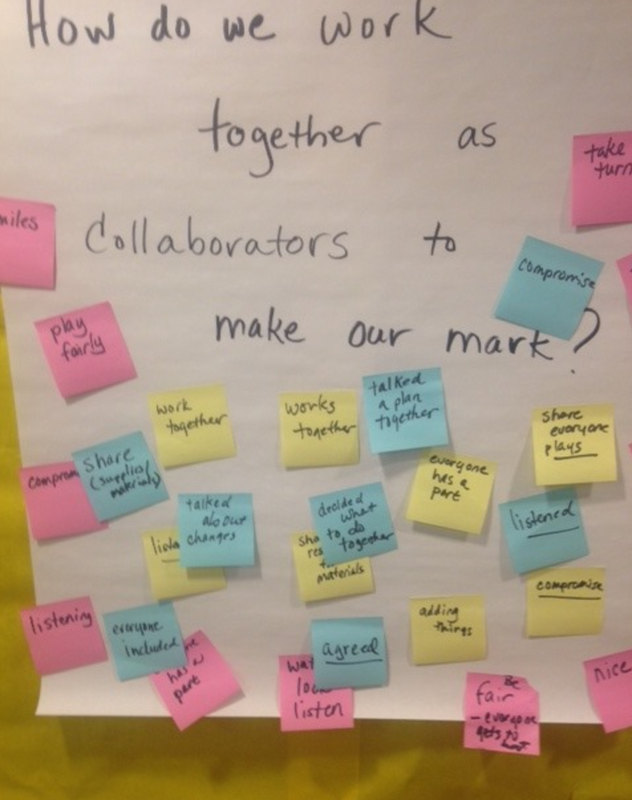 The collaborator qualities that the first grade students came up with have been used throughout the school year in their classrooms and in the library in other collaborative projects and activities that we have done. Students use the protocol developed during the ArtBot project to help them be good collaborators. *Click here to see some amazing videos of the ArtBots in action! Francis W. Parker School recently received the 2017 American Association of School Librarians’ (AASL) Collaborative School Library Award that recognizes and emphasizes school librarian and teacher collaboration while implementing library resources. What is the dynamic of this relationship in your school, and what sorts of activities do you collaborate on/with? We make every effort to cultivate a culture of collaboration at Francis W. Parker. We combined the library and Tech Ed departments and created a collaborative project time so that we were able to do more projects like the ArtBot project. Our administration is very supportive and gives teachers time to plan and work together to design lessons and projects that combine the curriculum of the classroom and the library and Tech Ed department so that students have deeper learning opportunities. We have collaborated with third grade classroom teachers and the science teacher on a zoo animal project. The unit combined the informative writing curriculum, scientific study of animals in the wild, zoos and conservation, technology skills including green screen video, research skills, and a design component that included designing a zoo habitat that was in the best interest of the animal based on research about the animal’s habitat, food source and behavior. We did an in-depth fourth grade project around fairy tales from around the world and literature themes in the book The Tale of Despereaux. Students were challenged with reading and identifying themes in different fairy tales from cultures from around the world. Students then illustrated scenes from the fairy tale that best highlighted a theme and used LittleBits circuits to make their scenes interactive with motion, light and sound. We also did a design project with kindergarten classes. They read the story of Little Red Riding Hood and focused on different elements of a story including beginning, middle, and end, characters, problem and setting. Students then designed a safer way to get Little Red from her house to her grandmother’s house. 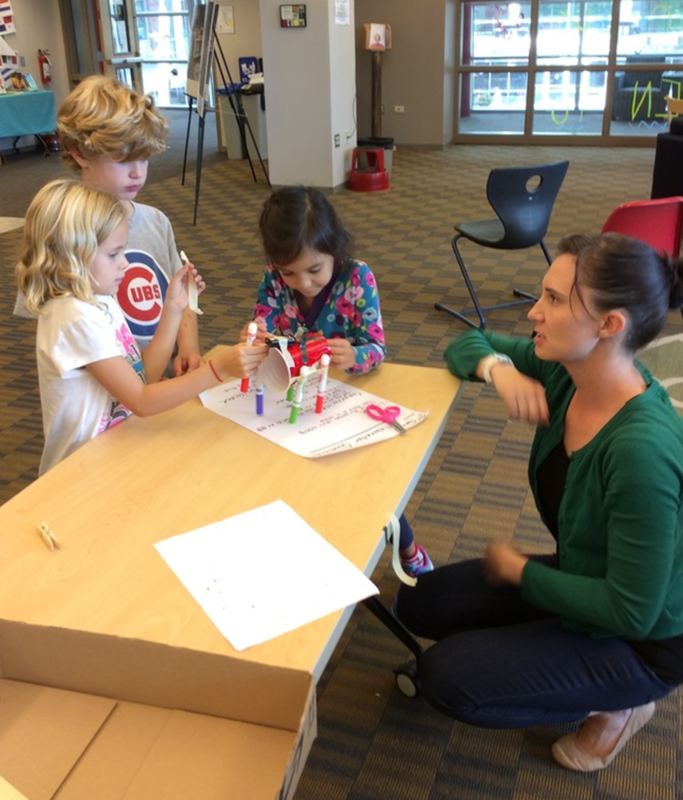 Kindergarteners worked with teachers to design their solutions in Tinkercad and 3D printed their ideas. Ideas included a hot air balloon, a fence to protect the path, and a taxi to drive her to grandma’s house. Our goal is to continue to expand the projects and lessons we collaborate on with our classroom and subject teachers so that students in every grade are doing 2-3 in-depth collaborative projects a year. What are your plans for Dot Day 2017? We will be using The Dot book again in the 2017 school year. It is a great book to launch our first collaborative project of the year with first graders. We will definitely be using the collaborator qualities protocol so that next year’s first graders will have ownership in the qualities of a collaborator that we will be using throughout the year. We will most likely change the project that they work on. We will have a planning day this summer with our whole collaborative team, including first grade classroom teachers, technology and library, to plan for the 2017-18 school year. Next year’s project will definitely include design, building and maker elements. We would love to include new technologies and building materials. We are always learning about new things and being inspired by so many great educators that we follow on twitter and meet at conferences. Whatever we end up doing, The Dot and Dot Day is always such an inspiration and provides a great foundation for our project. Curious about Dot Day? International Dot Day, celebrated on September 15th-ish, is a global celebration of creativity, courage and collaboration, and began when teacher Terry Shay introduced his classroom to Peter H. Reynolds’ book The Dot. Last year, over 7 million students in 166 countries joined the celebration. You can join here!